A high-quality education in science, technology, engineering, and math — subjects collectively known as STEM — helps children compete globally by developing their skills in thinking critically, evaluating evidence, and making sense of information. Importantly, students also learn to become problem solvers who can tackle our most pressing challenges, making society and the world a better place for generations to come. To meet the challenges of the 21st century and beyond, more students must be prepared with strong STEM skills. This work is ongoing and vital to the success of children, communities, and the country. Recognizing this need, President Barack Obama issued a call to action in 2011 to recruit and train 100,000 new STEM teachers over the next 10 years. In response to this call, 100Kin10, a network of 280 organizations — including school districts, universities, museums, foundations, corporations, and others — mobilized to put thousands of outstanding STEM teachers in the nation’s classrooms. 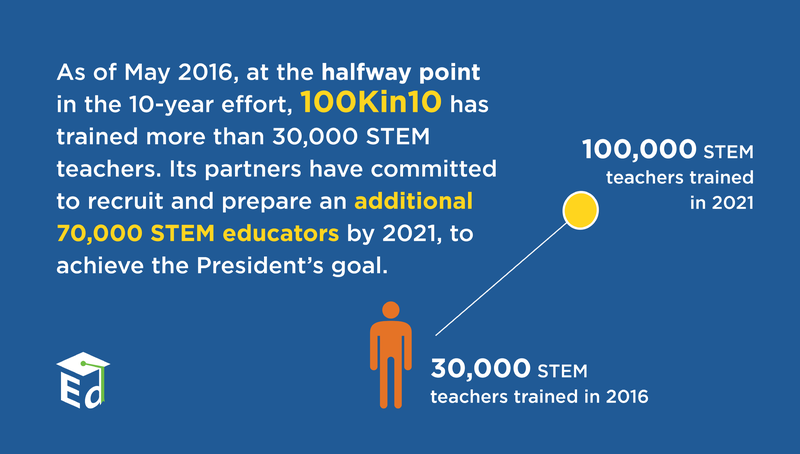 As of May 2016, at the halfway point in the 10-year effort, 100Kin10 has trained more than 30,000 teachers, and its partners have committed to recruit and prepare an additional 70,000 educators by 2021 — meaning that this coalition will achieve the President’s goal by the 10-year mark. By the year 2022, the nation will need approximately 1 million additional graduates in STEM fields to fill jobs in software development, biomedical engineering, computer systems analysis, and other technical fields. That workforce must reflect the diversity of the nation and include women, African Americans, Hispanics, and others who have been traditionally underrepresented in STEM classes and careers. That is why the President has taken significant steps, in collaboration with the business, nonprofit, and philanthropic sectors, to accelerate progress in STEM education across all levels of government. Leading companies, foundations, nonprofits, and science and engineering societies are participating in the President’s Educate to Innovate campaign, a collaborative effort to move American students from the middle to the top of the pack internationally in science and math achievement. 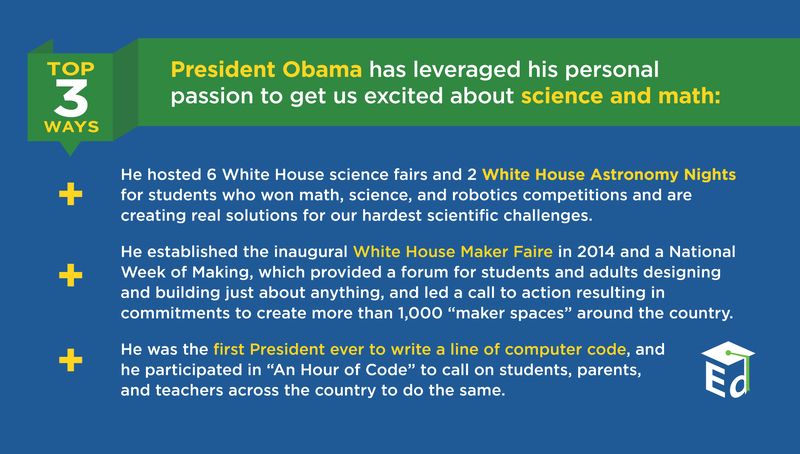 Throughout the Obama Administration, dozens of competitions for federal grants have made improving STEM teaching and learning a priority. For example, the Administration created the Race to the Top-District program to support educators in using innovative technologies that personalize student learning — tailoring the pace and instructional approach to students’ individual needs and interests. And, in higher education, the Hispanic-Serving Institutions-STEM program is helping to increase the number of Hispanic students attaining degrees in STEM subjects. The Department of Education also provided guidance to states and districts on using federal funds to support strategies that expand equity in STEM education from preschool through 12th grade. In April 2016, the White House announced hundreds of commitments to promote hands-on STEM learning for our youngest learners, including resources for parents and families to incorporate STEM concepts and vocabulary into their daily activities. With support from the U.S. Department of Defense and the National Math and Science Initiative, the Administration expanded STEM education to military families ensuring 60,000 military children in 200 schools around the country will get the opportunity to take STEM Advanced Placement courses. Additionally, with leadership from the National Science Foundation, engineering deans, and technology organizations, 25,000 more engineers are graduating from American universities each year compared to when President Obama took office. The increase is more than double the October 2011 goal set by the President’s Council on Jobs and Competitiveness when it issued a call to action to graduate 10,000 more engineers every year. And, through the White House’s College Opportunity Day of Action, college presidents, education leaders, nonprofit organizations, and others made more than 100 commitments to attract and retain thousands more students on a path to earn STEM degrees. 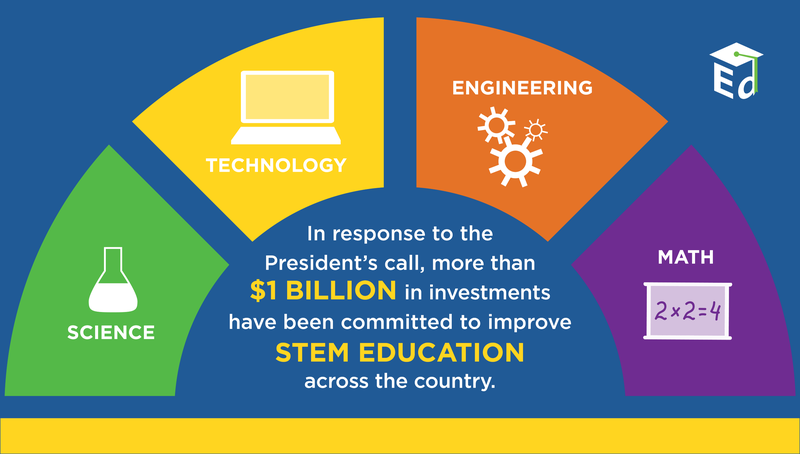 In response to the President’s call, more than $1 billion in investments have been committed to improve STEM education across the country. The President also launched the TechHire initiative in March 2015 to create a new pipeline for well-paying tech jobs and to equip people from all backgrounds with the skills they need to fill these positions. In the year since the initiative was launched, more than 600 employers in more than 50 communities committed to work across sectors to train people historically underrepresented in tech-related professions and connect them with jobs, resulting in thousands of new hires. The President’s $4 billion Computer Science for All proposal, would give all students the chance to learn computer science — a key STEM subject — in school. The National Science Foundation and the Corporation for National and Community Service jumpstarted this effort by committing more than $135 million to support and train computer science teachers. States and more than 30 school districts also have stepped up to expand computer science. Delaware and Hawaii committed to offering more opportunities for students to study this critical subject. Rhode Island announced a plan to provide computer science education to every student in the state. 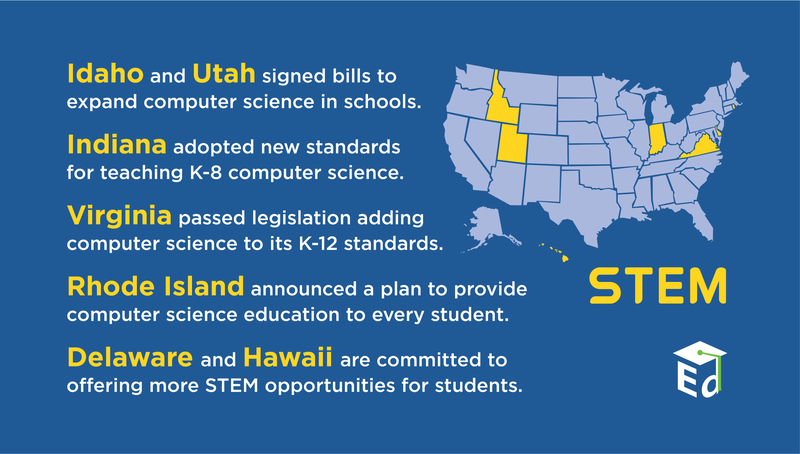 And since the President’s announcement, governors in Idaho and Utah have signed bills to expand computer science in their public schools. Virginia passed legislation adding computer science to its academic standards in kindergarten through 12th grade. And Indiana adopted new standards for teaching computer science in kindergarten through eighth grade. Even during difficult budget times, the Obama Administration maintained a strong focus on expanding the impact of federal efforts in STEM and investing in this area as an overall education reform strategy. The Obama Administration formed the Committee on STEM Education (CoSTEM), comprising 13 agencies, including the Department of Education, to create a national strategy to improve the delivery, impact, and visibility of STEM from preschool through college and careers. In 2013, CoSTEM released the Federal Science, Technology, Engineering, and Mathematics (STEM) Education 5-Year Strategic Plan. The President’s fiscal year 2017 budget also included new and continued funds to improve STEM instruction and support active learning; increase opportunities for underrepresented students to study STEM; and expand students’ access to rigorous STEM courses, particularly computer science. Building on the work of the Obama Administration, a new generation of problem-solvers can develop the STEM knowledge and skills they need to lead the nation and address the biggest challenges facing the world.